Opioids include heroin and prescription painkillers, such as fentanyl, oxycodone, hydrocodone, codeine, morphine, and many others. These drugs are extremely addictive, and the painful withdrawal symptoms often lead to relapse, which is why treatment is so important. Opioid drugs are either partial modifications of these naturally occurring substances (semi-synthetic) or are completely artificial (fully synthetic) 1. Many opioids have legitimate, medical uses like alleviating various types of pain, managing cough, and treating diarrhea. 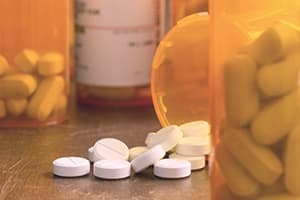 Opioid medications are widely prescribed with about 207 million total prescriptions written in 2013, according to the National Institute on Drug Abuse (NIDA) 2. Hydrocodone: Vicodin, Norco, and Zohydro. Oxycodone: OxyContin, Percocet, and Percodan. These prescription medications all carry the risk of opioid addiction and dependence, especially when misused 1.The opioid class of substances also includes heroin, which is an illicit drug synthesized from morphine 1. The Drug Enforcement Administration (DEA) considers all opioids to be controlled substances. Heroin is Schedule I with no recognized medical purpose and many of the opioid painkillers are Schedule II, meaning they have medicinal uses but carry a high risk of abuse 10. More than 2 million people have substance use disorders linked to prescription opioids. Nearly 500,000 people are addicted to heroin. All opioids can have a lasting negative impact when abused, but these substances also result in very distressing effects when the user quits. Opioid withdrawal symptoms can be erratic, yet quite severe as they impact numerous aspects of a person’s physical and mental health. Mental health symptoms, such as depression and anxiety. Gastrointestinal symptoms, such as nausea, vomiting, and diarrhea. Watery eyes and runny nose. Muscle aches, cramps, and spasms. If you worry that you or a loved one is at risk of opioid withdrawal symptoms, seeking detox treatment is a safe decision. The specific opioid of abuse. The dose, frequency, and route of administration. If the opioid was abused concurrently with other substances (i.e., polysubstance abuse). The individual’s physical and mental health status. Withdrawal symptoms from short-acting opioids, like heroin, present 6 to 12 hours after last use and will last for 5-7 days overall 5. Long-acting opioids, like methadone, will have delayed withdrawal symptoms and longer total durations with symptoms arising between 2-4 days after the most recent dose and possibly lasting for 3 weeks 5,6,7. Again, the individual differences will dictate many aspects of withdrawal and detox, including the timeline and intensity of symptoms, be they acute or protracted in nature. Relapse/overdose: The reduced tolerance for opioids during recovery paired with strong cravings can result in relapses, overdose, and possibly death. Dehydration/aspiration: The tendency to vomit, sweat, and have diarrhea results in dehydration. While vomiting, some will inhale and choke causing aspiration of stomach contents into lungs. Pain sensitivity: Without the opioid in the body, the individual will have a decreased tolerance for pain and discomfort. Cardiac distress: Opioid withdrawal can add stress to a person’s cardiovascular health by increasing blood pressure and heart rate. Depression/anxiety: With increased mental health stress during drug detox, people regularly report higher levels of depression and anxiety. Inpatient/residential: Any treatment that allows the client to live at the facility during treatment is labeled inpatient/ residential. The term “inpatient” sometimes applies to more intense, short-term programs that are typically conducted in hospital settings. Residential programs may be longer in duration and more closely resemble a home setting. Outpatient: Treatments that allow the individual to continue with daily life while attending treatment during the day are considered outpatient. These programs are best for people with relatively less severe addictions and stronger support systems in place. Outpatient detox treatment occurs in many locations like doctor’s offices and community health centers. Suboxone: A combination of naloxone, an opioid antagonist, and buprenorphine, a partial opioid agonist, designed to prevent diversion and abuse of buprenorphine. This medication alleviates cravings and opioid detox symptoms without producing a euphoric rush. Methadone: A full opioid agonist that reduces opioid withdrawal symptoms, eases cravings, doesn’t elicit a high. Naltrexone: An opioid antagonist that blocks the desirable effects of opioids to prevent abuse. As mentioned, opioid detox programs are short-term. They do not serve as a substitution for comprehensive substance abuse treatment. Following detox, it is important that an individual in recovery pursues opioid addiction treatment to promote increased success and longer periods of abstinence 9. National Institute on Drug Abuse. (2014). America’s Addiction to Opioids: Heroin and Prescription Drug Abuse. Drug Enforcement Administration. (n.d.). Narcotics. Drug Enforcement Administration (2006). Practitioner’s Manual: An Informational Outline of the Controlled Substances Act. National Institute on Drug Abuse. (2014). What are the treatments for heroin addiction? How Addictive Are Prescription Opioids? What Happens When You Overdose on Opioids?